It is now well established that cells modify chromatin to establish transcriptionally active or inactive chromosomal regions. Such regulation of the chromatin structure is essential for the proper development of organisms. C. elegans is a powerful organism for exploring the developmental role of chromatin factors and their regulation. This chapter presents an overview of recent studies on chromatin factors in C. elegans with a description of their key roles in a variety of cellular and developmental processes. Cell differentiation in multicellullar organisms is the consequence of the precise actions of many genes whose individual expression is temporally and spatially regulated. Identification and analysis of tissue or cell-specific transcription factors have made significant contributions to our understanding of the process of cellular differentiation. However, it has become clear that tissue-specific transcription factors alone are not sufficient to start cellular differentiation. Dramatic morphological and structural changes of chromatin, known as chromatin remodeling, play vital roles in establishing cell-specific gene expression patterns and therefore, also regulate the initiation of cellular differentiation (reviewed by de la Serna et al., 2006; see Transcription mechanisms). In the nuclei of eukaryotic cells, genomic DNA is packaged with histone proteins into chromatin. There are four types of core histones (H2A, H2B, H3 and H4), each having a flexible amino-terminal ‘tail’ of 25–40 residues. The N-terminal tails do not adopt a defined structure in the crystal of a mononucleosome (Luger et al., 1997). However, the amino acid sequences of these N-terminal tails are highly conserved, likely due to the important functions of a number of important post-translational modifications at these sequences. These modifications, including acetylation and methylation of lysines (K) and arginines (R), phosphorylation of serines (S) and threonines (T), ubiquitylation and sumoylation of lysines, as well as ribosylation, are carried out by a variety of chromatin modifying complexes, such as the COMPASS (for histone methylation), NuA4/Tip60 (for Histone H4 acetylation), NuA3 (for Histone H3 acetylation) complexes (Allard et al., 1999; Howe et al., 2001; Jenuwein and Allis, 2001; Peterson and Laniel, 2004). All of these chromatin modifying complexes contain one of the histone modification enzymes, such as histone acetyltransferase (HAT), histone deacetylase (HDAC), histone methyltransferase (HMT) and histone kinase (reviewed by Jenuwein and Allis, 2001; Peterson and Laniel, 2004). These chromatin modification complexes work in concert with ATP-dependent chromatin-remodeling complexes, including the SWI/SNF, ISWI and NURD/Mi-2/CHD complexes, which recognize specific histone modifications to restructure and mobilize nucleosomes (see Figure 1; reviewed by Cairns, 2005; Saha et al., 2006). An additional layer of chromatin remodeling is carried out by the incorporation of histone variants (e.g., by SWR1/SRCAP) that specialize chromatin at particular regions (see Figure 1; Kobor et al., 2004; Krogan et al., 2004; Mizuguchi et al., 2004; Ruhl et al., 2006). Components of both the chromatin modifying complexes and chromatin remodeling complexes are termed chromatin factors in this review. We will focus on what nematode genetics has taught us about the developmental roles of chromatin factors. C. elegans core histones are very conserved in structure, with at least 80% identical amino acid sequence when compared to the human histones (Vanfleteren et al., 1986; Vanfleteren et al., 1987a; Vanfleteren et al., 1987b; Vanfleteren et al., 1987c; Vanfleteren et al., 1989). In particular, the amino acid sequences of the C. elegans H3 (CeHIS3) and H4 (CeHIS4) proteins are 97% and 98% identical to their human counterparts, respectively (see Figure 1). Some of the post-translational modifications of the CeHIS3 and CeHIS4 proteins have been experimentally identified and shown to be identical to those in human H3 and H4 proteins (see Figure 1; Vanfleteren et al., 1987b; Vanfleteren et al., 1987c; Kelly et al., 2002; Bender et al., 2004b; Bender et al., 2006). Although not all post-translational modifications of the CeH3 and CeH4 proteins have been thoroughly investigated, it is expected based on sequence conservation that the vast majority, if not all, of the post-translational modifications found in human H3 and H4 are present in C. elegans counterparts (see Figure 1). This prediction is consistent with the hypothesis that C. elegans has homologs of all the mammalian histone modification enzymes. Some histone modification enzymes in C. elegans have been studied using genetic and biochemical approaches (see Table 1; Bender et al., 2004b; Bender et al., 2006; Whetstine et al., 2006). MES-2, the ortholog of human EZH2 has been reported to be a histone methyltransferase (HMT) for H3 lysine 27 (Bender et al., 2004b). MES-4, a SET domain containing protein, has recently been shown to have HMT activity in vitro. It has also been shown to be required for histone H3K36 dimethylation in mitotic and early meiotic germline nuclei and in early embryonic cells (Bender et al., 2006). A recent discovery of the histone demethylase JMJD2A in mammalian cells has led to the identification of the C. elegans homolog, JMJD-2 (Whetstine et al., 2006). This protein family has been shown to be required for reducing the H3-K9/K36 trimethylation. Figure 1. Histone modifications and chromatin remodeling complexes. (A) Alignment of C. elegans histone H3 (CeHIS3) and Homo sapiens histone H3 (HsHIS3) with the characterized histone modifications marked. (B) Alignment of C. elegans histone H4 (CeHIS4) and Homo sapiens histone H4 (HsHIS4) with the characterized histone modifications marked. (C) The four best-characterized ATP-dependent chromatin remodeling complexes in yeast and mammalian systems are known or thought to interact with specific chromatin substrates to restructure and mobilize nucleosomes. *Only chromatin factors that have been either genetically or functionally characterized in C. elegans are listed in this table. Genes are divided into several different categories based on either their characterized functions in C. elegans or molecular functions of their homologs in yeast, Drosophila, and/or mammals. Furthermore, the C. elegans genome contains homologs of many other mammalian chromatin factors. A large number of putative chromatin factors in C. elegans, which have been investigated either genetically or functionally, are listed in Table 1. Powerful genetics, including the application of dsRNA-mediated gene inactivation (RNA interference or RNAi), has rendered C. elegans an excellent model organism to study the functions of various chromatin factors in development. Cellular and developmental roles of many of the C. elegans chromatin factors have already been characterized by genetic approaches (Table 1, see below). Notably, C. elegans homologs of components of several chromatin modification and remodeling complexes have been found to play essential roles in vulval development, germline development, germline-soma distinction, repetitive transgene silencing in both germline and soma, RNAi, somatic gonad development, and larval development (Andersen et al., 2006; Bender et al., 2004a; Cardoso et al., 2005; Cui et al., 2006a; Cui et al., 2004; Fong et al., 2002; Kelly et al., 2002; Kim et al., 2005; Robert et al., 2005; Wang et al., 2005; see Germline chromatin; Specification of the germ line; Transcription mechanisms). Chromatin factors play an essential role in germline development, which is described in detail in the Germline chromatin chapter. In brief, while the embryonic germ cells display a unique pattern of histone modifications, the post-embryonic germ cells exhibit specific chromatin modifications on the X chromosome (see Germline chromatin). Here we focus on reviewing studies investigating the role of chromatin factors in several aspects during the development of somatic tissues. C. elegans vulval differentiation has been one of the most extensively analyzed systems for studying cell signaling and developmental pattern formation (see Vulval development). The differentiation of vulval cell types from multiple competent hypodermal precursor cells is triggered and regulated by the actions of multiple cell signaling pathways including the RTK/RAS/MPK pathway (see RTK/Ras/MAP kinase signaling), the LIN-12/Notch pathway (see LIN-12/Notch signaling in C. elegans) and the Wnt pathway (see Wnt signaling). However, one of the most fascinating aspects of vulval induction is the discovery and extensive analysis of the so-called synthetic Multivulva (SynMuv) genes that act redundantly to repress vulval differentiation (Ferguson and Horvitz, 1989; Horvitz and Sulston, 1980; see Vulval development). SynMuv genes are divided into three classes (A, B, and C) based on their genetic properties. Single mutations in most of the SynMuv genes do not generate a robust Multivulva phenotype, but a combination of two mutations in two of the three classes does give this phenotype (Ceol and Horvitz, 2004; Ferguson and Horvitz, 1989), indicating genetic redundancies associated with SynMuv genes. The SynMuv phenotype can be suppressed by mutations in genes acting in the RTK/RAS/MPK signaling pathway, suggesting that the expression of the phenotype depends on this signaling activity (Sternberg and Han, 1998; see Vulval development). The majority of the known SynMuv genes have been identified through positional cloning. Many of the SynMuv B genes appear to encode chromatin factors that are known to be involved in gene silencing. These include factors that modify histones through deacetylation, methylation and sumoylation events, as well as factors that remodel nucleosomes. hda-1, encoding a histone deacetylase, is a good example of this (Dufourcq et al., 2002; Solari and Ahringer, 2000; Table 1). met-2, a recently identified SynMuv B gene, encodes a homolog of mammalian SETDB1, a histone H3 lysine 9 (H3K9) methyltransferase of the Suv39 family (Poulin et al., 2005). H3K9 methylation is an essential step for the binding of the HP1 protein to histones, which plays a critical role in the formation of heterochromatin. Within a heterochromatin region, gene expression is typically silenced (Danzer and Wallrath, 2004). Consistent with this model, hpl-2, a C. elegans homolog of HP1, was also reported as a SynMuv B gene (Couteau et al., 2002). Genes in the sumoylation pathway, smo-1/SUMO, uba-2, and ubc-9, have recently been found to have genetic properties similar to SynMuv B genes (Poulin et al., 2005). Histone sumoylation is known to be involved in transcription repression in S. cerevisiae (Nathan et al., 2006). Furthermore, SynMuv B genes lin-53, let-418 and mep-1, encode components of the NURD complex (Lu and Horvitz, 1998; Unhavaithaya et al., 2002; von Zelewsky et al., 2000; Table 1). Current models propose that the NuRD complex functions primarily in transcriptional repression (Xue et al., 1998). Unlike SynMuv B genes that encode proteins known to be involved in gene silencing, SynMuv C genes encode potential components of the NuA4/Tip60 complex known to be responsible for histone H4 acetylation that marks active transcription (see Table 1; Ceol and Horvitz, 2004; Peterson and Laniel, 2004). Linking SynMuv C genes to histone acetylation was a surprise and raised intriguing questions for further analysis. It is possible that the SynMuv phenotype of SynMuv B and C mutants may result from the regulation of different target genes by these two classes. 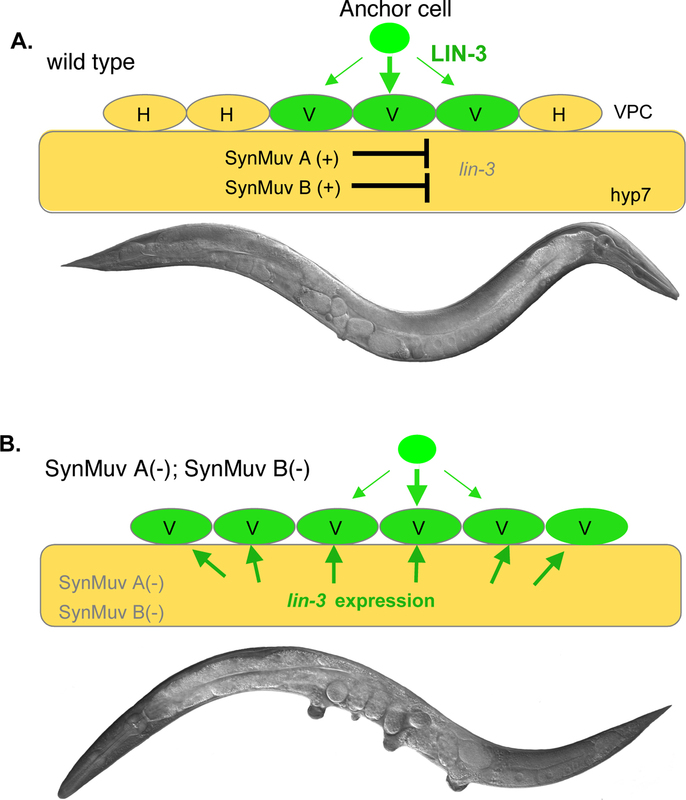 Understanding the mechanisms by which SynMuv genes function in vulval development has attracted extensive research interest for the past 20 years. Mosaic analysis and induction of tissue specific expression of several SynMuv genes have led to the hypothesis that SynMuv genes act in the large hypodermal syncytial cell hyp7 to repress vulval cell fates (Hedgecock and Herman, 1995; Herman and Hedgecock, 1990; Myers and Greenwald, 2005). Further genetic results indicate that lin-3/EGF, which encodes the signaling molecule to activate the RTK/RAS/MPK pathway, is a key target of SynMuv A and B genes in hyp7 (Cui et al., 2006a). In wild-type worms, lin-3/EGF expression is repressed in hpy7 by SynMuv A and SynMuv B genes in hyp7, and the SynMuv phenotype of at least some SynMuv double mutants has been shown to be the consequence of the ectopic expression of lin-3/EGF in hyp7 (Cui et al., 2006a; see Figure 2). Figure 2. Model for the molecular basis of how SynMuv A and SynMuv B genes regulate vulval induction (Cui et al., 2006a). (A) In wild type, lin-3 is inhibited in the hpy7 syncytium redundantly by SynMuv A and SynMuv B genes. Thus, only three of the six vulval precursor cells (VPCs), P3.p-P8.p to adopt vulval cell fates (V) are induced by the LIN-3 signal from the anchor cell (AC) in the gonad, while the other three VPCs, not receiving LIN-3 signal, divide once to generate daughter cells that fuse to hyp7 to become part of the hypodermis (H) (see Vulval development). (B) In SynMuv A(lf); SynMuv B(lf) double mutants, the de-repression of lin-3 in hyp7 leads to the activation of RTK/RAS/MPK pathway in all six VPCs, which results in a Muv phenotype. Mutations that suppress the synMuv mutant phenotype have led to identification of many SynMuv suppressor genes. The SynMuv suppressor genes are expected to positively regulate vulval differentiation, which may be achieved through activating genes involved in vulval induction. Indeed, many SynMuv suppressor genes were found to encode chromatin factors that are potentially transcription activators (see Table 1; Andersen et al., 2006; Cui et al., 2006b; Wang et al., 2005; see Transcription mechanisms). These chromatin factors include homologs of components of the NuA3 complex that acetylates histone H3, the COMPASS/MLL complex that methylates histone H3, the SWR1/SRCAP complex that catalyzes the exchange of the histone variant H2A.Z into nucleosomes, and the ATP-dependent chromatin remodeling complex (ISW1/NURF) (J. Cote: personal communication; Andersen et al., 2006; Cui et al., 2006b; Doyon et al., 2006; Eissenberg et al., 2005; Howe et al., 2001; Park and Roeder, 2006; Ruhl et al., 2006; Wang et al., 2005; see Table 1). 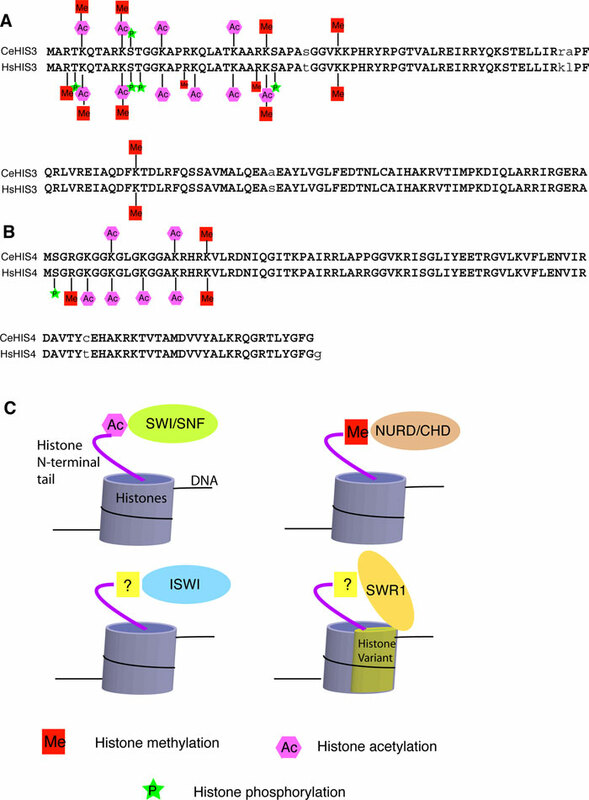 Histone acetylation by the NuA3 complex as well as by the subunits of TFIIIC, histone H3 K4 tri-methylation by the COMPASS and ISW1 complexes, and the incorporation of H2A.Z into euchromatin by the SWR1/SRCAP complex, have been shown to be generally correlated with active transcription in yeast and mammals (reviewed by Cairns (2005); Peterson and Laniel (2004); Saha et al. (2006)). For vulval induction, some of the SynMuv suppressor genes may act to antagonize SynMuv genes in regulating lin-3/EGF expression. However, since a disruption of signaling activity downstream of lin-3 can also suppress the SynMuv phenotype, it is possible that some SynMuv suppressor genes act on different targets. The antagonism between the SynMuv B family and the SynMuv suppressor family of chromatin modifiers was also observed in a number of other developmental events (see below). In some cases, antagonistic activities of these two sets of chromatin modifiers on the same targets were evident. For example, SynMuv B genes prevent the ectopic expression of lag-2 in intestine and hypodermal cells, and pgl-1 in somatic cells, while the SynMuv suppressors are required for the ectopic expression of both the lag-2 and pgl-1 genes (Andersen et al., 2006; Cui et al., 2006b; Dufourcq et al., 2002; Poulin et al., 2005; Wang et al., 2005). Asymmetric cell divisions generate cells with different cell fates that produce cellular diversity during development in both animals and plants. The mechanism of asymmetric cell divisions is quite complicated, as many signaling pathways and both intercellular and intrinsic determinants are involved (Betschinger and Knoblich, 2004; Morrison and Kimble, 2006). An extensive reprogramming of gene expression is associated with a given asymmetric cell division event and general chromatin modifiers are expected to be involved in the process. In the yeast S. cerevisiae, the switching of the mating type is regulated by the endonuclease HO, which is transcriptionally activated by the temporal binding of the SWI/SNF and SAGA chromatin remodeling complexes to its promoter (Cosma et al., 1999). Similarly, components of the SWI/SNF and the NuRD chromatin remodeling complexes have been shown to be required for asymmetric cell division of the T blast cells in C. elegans (Cui et al., 2004; Herman et al., 1999; Sawa et al., 2000). psa-1 and psa-4 genes were identified in a genetic screen for the phasmid socket absent (psa) phenotype (Sawa et al., 2000). Phasmid socket absent is the consequence of defective asymmetric division of the T cell (Sternberg and Horvitz, 1988). The psa-1 and psa-4 genes encode proteins similar to SWI3 and SWI2/SNF, which are components of the SWI/SNF complex (Sawa et al., 2000). Other components of the SWI/SNF complex in C. elegans were also found to play a role in asymmetric T cell division (Sawa et al., 2000). Wnt signaling has long been known to be involved in regulating T cell division (Herman et al., 1995; Sawa et al., 1996). The current model is that either Wnt signaling regulates transcription factors acting in parallel to the SWI/SNF complex, or Wnt signaling directly regulates the activity of the SWI/SNF complex. However, without the identification of the direct target(s), the molecular mechanism by which chromatin modifiers participate in asymmetric cell division remains unclear. Asymmetric cell divisions during embryonic development in C. elegans have been extensively studied and many genes activated in the processes have been identified and characterized (see Asymmetric cell division and axis formation in the embryo). Although the functions of chromatin factors in these asymmetric cell divisions have not yet been reported, the involvement of chromatin factors in these processes may still be expected. Male tail ray development provides an ideal model system for investigating how hox genes are involved in cell fate specification (see Male development). There are nine pairs of bilateral sensory rays in the C. elegans male tail; each has a unique shape and position on the body axis (Sulston and White, 1980). The six pairs of V rays are generated from the posterior hypodermal blast cells (also called seam cells) V5 (ray 1) and V6 (rays 2–6), while the three most-posterior pairs of T rays (rays 7–9) derive from the blast cell T (Sulston and White, 1980). A hox gene mab-5 expressed in the V5 and V6 cell lineages directs these cells to develop into rays, while another hox gene egl-5 expressed only in the V6 lineage is required for the development and differentiation of V6 rays (Ferreira et al., 1999; Kenyon et al., 1997). Polycomb group (PcG) genes (sop-2, mes-2, mes-3, and mes-6) and trithorax-related genes (lin-49 and lin-59) are required for the normal development of the male tail (Table 1; Chamberlin and Thomas, 2000; Ross and Zarkower, 2003; Zhang et al., 2003b). The defects of ray development in lin-49, lin-59, sop-2 and mes mutants have been shown to be the consequences of mis-regulation of the expression of hox genes mab-5 and egl-5 (Chamberlin and Thomas, 2000; Ross and Zarkower, 2003; Zhang et al., 2003b). lin-49 and lin-59 function in activating or maintaining the expression of the hox genes (Chamberlin and Thomas, 2000). In contrast, sop-2 and mes genes are required for inhibiting the ectopic expression of several hox genes including mab-5 and egl-5 (Ross and Zarkower, 2003; Zhang et al., 2003b). Similarly, in Drosophila, PcG proteins act as transcription repressors, and trithorax group proteins act as transcription activators (reviewed by (Grimaud et al., 2006). These two antagonistically acting groups of regulators maintain the transcriptional OFF and ON states of Hox genes and other target genes through regulating histone trimethylations (Papp and Muller, 2006). Since multiple components of the PcG complex have been identified in the fly (Ross and Zarkower, 2003), additional C. elegans genes of the similar complex likely exist and thus remain to be identified. It may also be expected that chromatin factors other than PcG and trithorax proteins are involved in male tail development. As discussed in the preceding section, psa-1 and psa-4, encoding components of the SWI/SNF complex, control the asymmetric T cell division (Sawa et al., 2000). Rays 7–9 in the male tail are derived from the T cell (Sulston and White, 1980). It would not be surprising if psa-1 and psa-4 mutant animals have defects in male tail development. In all complex genomes, repetitive elements form a significant fraction of genomic complexity. These elements are often assembled into condensed, transcriptionally silent chromatin states (heterochromatin). In C. elegans, DNA transformation techniques produce repetitive extra-chromosomal DNA arrays. Expression of transgenes organized in repetitive arrays is silenced in the germ line (Kelly and Fire, 1998; see Germline chromatin). It has been shown that chromatin factors are involved in the maintenance of transgene silencing, as mutations in the Polycomb Group related proteins MES-2 and MES-6 relieve the silencing (Kelly and Fire, 1998). Further analysis has shown that histone 3 lysine 9 (H3K9) di- and tri-methylations are enriched on extrachromosomal arrays (Bean et al., 2004). H3K9 methylation is a hallmark of the heterochromatin structure. These findings suggest that heterochromatin formation is associated with repetitive transgene silencing in C. elegans. Repetitive transgene silencing involves a number of other chromatin factors in addition to MES-2 and MES-6 (see Table 1; Couteau et al., 2002; Cui et al., 2006b; Jedrusik and Schulze, 2001; Kelly and Fire, 1998; Kim et al., 2005; Robert et al., 2005). Repetitive transgene silencing in somatic cells has been shown to be regulated by a number of chromatin factors including those involving in germline transgenes silencing (see Table 1; Hsieh et al., 1999; Andersen et al., 2006; Cui et al., 2006b; Grishok et al., 2005; Wang et al., 2005). RNA interference (RNAi) is a relatively novel silencing process resulting in messenger RNA degradation, translational inhibition, heterochromatin formation, or possibly even a combination of these events (Bernstein and Allis, 2005; Fire et al., 1998; Grishok, 2005; Guo and Kemphues, 1995). For the post-transcriptional gene silencing (PTGS) effects of RNAi, the prevailing model is that the RNAi pathway uses small interfering RNAs to induce degradation of cognate messenger RNAs in a sequence-specific manner (for review, see, Hannon, 2002; Meister et al., 2004). Recently, RNAi-mediated transcriptional gene silencing (RNAi-TGS) has become a research focus. Like PTGS, this silencing has been proposed to be regulated by a subset of small RNAs generated by the RNAi machinery. RNAi-mediated chromatin effects have been uncovered in a variety of organisms including yeast, Tetrahymena, Drosophila, and mammals (reviewed by Martienssen et al., 2005; Mochizuki and Gorovsky, 2004; Verdel and Moazed, 2005). A RITS (RNA-induced transcriptional silencing) complex—which contains Ago1, Chp1 (a chromodomain- containing protein), and a novel protein of unknown function referred to as Tas3-was purified from S. pombe (Verdel et al., 2004). The RITS complex is also known to bind to all known heterochromatic loci, including centromeres, telomeres, and the mat locus (Volpe et al., 2002). The binding of RITS to these loci is dependent on H3K9 methylation, a hallmark of heterochromatin. Therefore, RNAi plays a critical role in the establishment of heterochromatin at repetitive loci in S. pombe. RNAi may play a similar role in promoting heterochromatin formation at the repetitive transgene arrays in C. elegans. This hypothesis is supported by the fact that many genes in the RNAi-pathway have been shown to be involved in RNAi-TGS to silence the expression of repetitive transgenes in the germ line and/or the somatic cells in C. elegans (Grishok et al., 2005). Recently, a number of chromatin factors have been implicated in RNAi targeting of endogenous genes in C. elegans (see Table 1; Cui et al., 2006b; Dudley et al., 2002; Kim et al., 2005), leading to speculation about a transcriptional component in conventional RNAi. When these genes are knocked down by RNAi, the efficiency of subsequent RNAi targeting of additional genes is significantly reduced (Cui et al., 2006b; Dudley et al., 2002; Kim et al., 2005). These findings suggest that chromatin factors play an important role in the RNAi pathway. It may be speculated that a key RNAi factor may be transcriptionally regulated by these chromatin factors. However, indirect effects may not be excluded at this point. An intriguing recent finding revealed that RNAi in C. elegans induces inherited transcriptional silencing in the absence of the original trigger, and such an effect depends on several chromatin factors (see Table 1; Vastenhouw et al., 2006). This finding further implicates the roles of chromatin modification and remodeling in establishing RNAi-induced epigenetic effects. In C. elegans, germline specification is known to be controlled by PIE-1 and chromatin factors (MES proteins; see Specification of the germ line and Germline chromatin). PIE-1 specifies the germline fate by blocking transcriptional elongation and preventing the expression of genes for somatic differentiation in the germline blastomeres (Batchelder et al., 1999; Seydoux and Dunn, 1997; Zhang et al., 2003a). The MES proteins maintain the chromatin status that the nascent germ line (i.e. Z2 and Z3) inherits and specify the expression patterns of germline genes once PIE-1 repression is lifted (see Specification of the germ line). Recent studies have shown that somatic cell specification is controlled by a number of SynMuv B genes and SynMuv suppressors (Cui et al., 2006b; Unhavaithaya et al., 2002; Wang et al., 2005). Some SynMuv B mutants display misexpression of germline specific genes and mis-distribution of germline P granules in somatic cells (Cui et al., 2006b; Unhavaithaya et al., 2002; Wang et al., 2005). Intriguingly, these abnormalities have been shown to be suppressed by loss-of-function mutations in mes genes and a number of SynMuv suppressor genes (Cui et al., 2006b; Unhavaithaya et al., 2002). Since many SynMuv suppressor genes encode chromatin factors as mentioned earlier, these results reenforce the concept that chromatin factors play critical roles in germline-soma distinction. Repressing the expression of the germline specific genes in the somatic cells could play a critical role in germline-soma distinction (see Specification of the germ line and Germline chromatin; Cui et al., 2006b; Unhavaithaya et al., 2002; Wang et al., 2005). However, the molecular mechanisms for this relationship is still not well understood; it is not clear whether the somatic misexpression of the germline specific genes is the cause or the result of soma to germline transformation. Chromatin factors appear to be involved in a variety of cellular and developmental processes in C. elegans. Apparently they are not restricted to the biological processes discussed in this chapter. Chromatin factors also play a role in genome stability, embryonic development, foregut development, etc. (Pothof et al., 2003; Updike and Mango, 2006). An important further research direction is to identify more genes or chromosomal regions that are key direct targets of the chromatin factors for specific developmental events, and to investigate how chromatin factors interact with tissue-specific transcription factors in turning these target genes on and off in response to developmental signals. We thank Aileen Sewell, Emylie Seamen, Jen Blanchette for comments and critical reading, J. Cote for personal communications, and the two reviewers for valuable revision suggestions. Supported by an NIH grant and the Howard Hughes Medical Institute of which M. C. is an associate and M. H. is an investigator. *Edited by Thomas Blumenthal. Last revised February 12, 2007. Published May 3, 2007. This chapter should be cited as: Cui, M. and Han, M. Roles of chromatin factors in C. elegans development (May 3, 2007), WormBook, ed. The C. elegans Research Community, WormBook, doi/10.1895/wormbook.1.139.1, http://www.wormbook.org. Copyright: © 2007 Mingxue Cui and Min Han. This is an open-access article distributed under the terms of the Creative Commons Attribution License, which permits unrestricted use, distribution, and reproduction in any medium, provided the original author and source are credited.